The ensuing email conversation clarified that we were discussing manilagrass (Zoysia matrella, or korai as it is called in Japan). I’ve put more excerpts from that conversation at the very end, but for now I want to compare temperatures from 2017 at 11 locations, and discuss how that might have some relation to how well manilagrass will perform at a location. I downloaded the daily temperature data for calendar year 2017 from these 11 locations. Some of these places, like Singapore, and Tokyo, and Hilo, have lots of thriving manilagrass. Here’s a lawn in central Tokyo. Other places, like Ithaca (New York), don’t have manilagrass, because it is too cold. And places like Avondale, Pennsylvania, may have a bit of Zoysia japonica, and some Cynodon, but are generally cool-season areas. If we consider Singapore as optimum for manilagrass, and Ithaca as unsuitable, we can then see how some other places (like Napa) compare. Are they closer to Singapore, which is optimum, and Tokyo, where manilagrass works well, or are they closer to Ithaca? Manilagrass thrives in a tropical climate; this species really grows well when it is hot, but it doesn’t grow much in moderate temperatures. To look at when it is hot, I calculated the GDD20 for each day in 2017 at each of these locations, and summed them across the year. This is the sum of temperatures at 20 °C and above in 2017. Of course, there are various ways to look at when it is “hot.” This table shows the sum for various measures related to temperature. Each of these is based on the daily mean temperature calculated as (daily high + daily low)/2. I included Vilobí d’Onyar because it is slightly warmer than Napa, and I’ve had a chance to see how manilagrass and bermudagrass performed there. 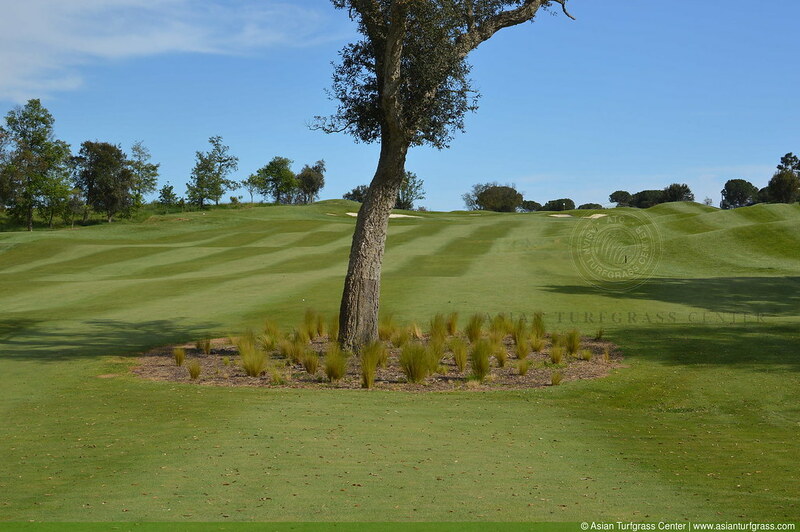 Here’s a mixed fairway of bermudagrass and bentgrass in Vilobí d’Onyar in May. Here’s a driving range tee of manilagrass there in May. 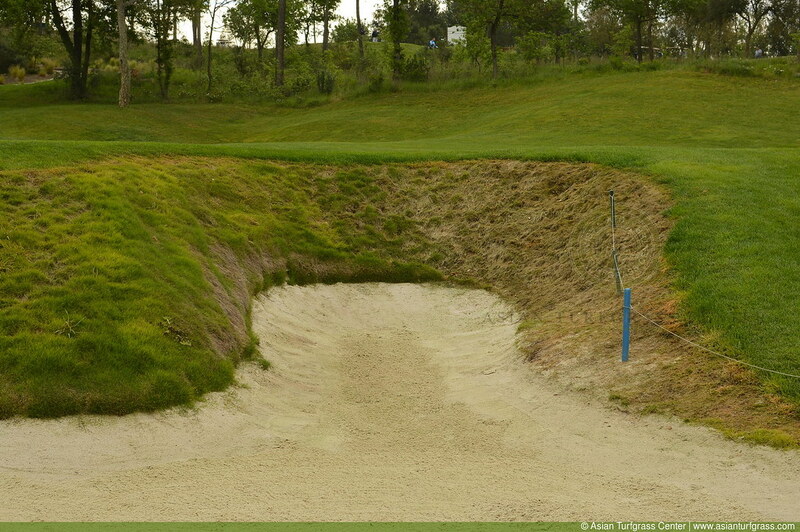 This is a bunker slope of manilagrass in May. Here it is at the back of the same driving range tee in January, 2.5 years after it was sodded. Can it survive in those temperatures? 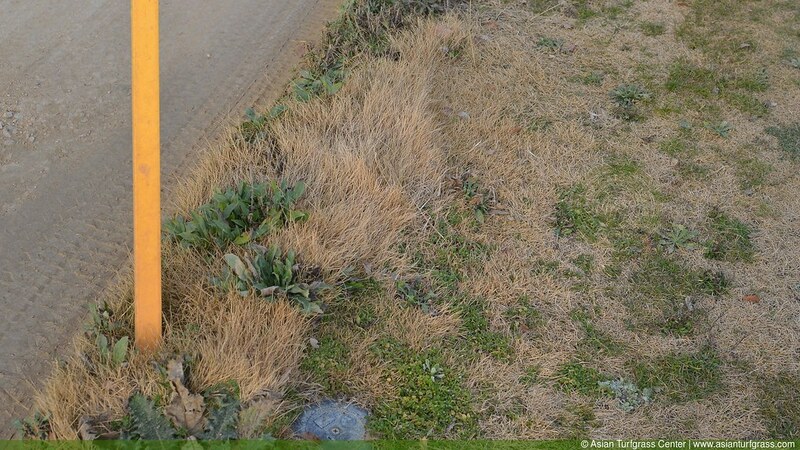 Yes, although it isn’t doing well on north-facing bunker slopes. 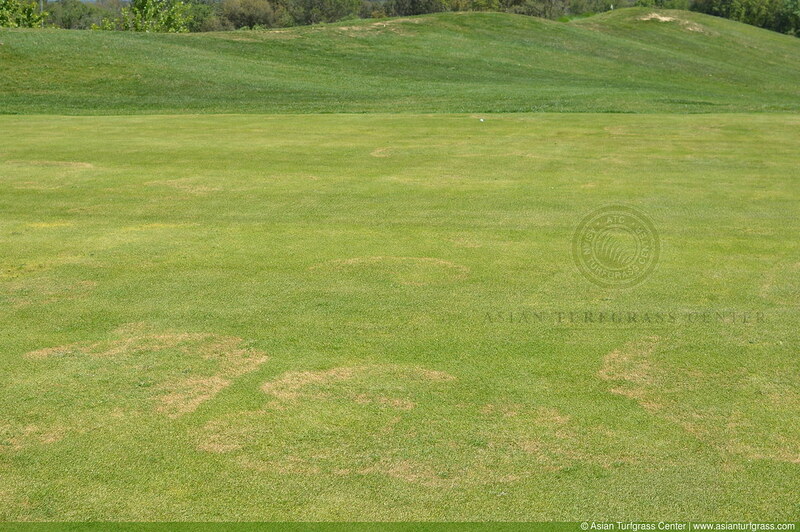 The driving range tee was especially well-drained, but large patch was thriving. Manilagrass is renowned for density, and it is difficult for weeds to invade manilagrass where it is actively growing. That, however, is not the case at Vilobí d’Onyar. Now for more of my response to the Napa email. I made similar calculations and predictions for the Vilobí d’Onyar location prior to the installation of manilagrass. I’m all for doing grass tests at different locations, but there is also something to be said for considering the climate. “I am hoping to learn your point of view,” my correspondent wrote. I am glad you have been impressed with zoysia. I am too. For grass on golf courses, one must consider the adaptation of the species to the climate, and also consider the type of playability that one wants. For the climatological areas where zoysia is native—East and Southeast Asia—one will find that zoysia gives the best playability with the fewest inputs. I am less enthusiastic about zoysia in the US, because the climate is better for bermudagrass there. So one may have to give more inputs to zoysia in the US to keep the bermuda from invading, and then the benefit is one of nice zoysia playability but perhaps with more inputs than one would require for bermuda. Zoysia can give the look of the photos you sent. I think bermuda can too. In a sunny place like Napa, I’d probably go for bermuda rather than zoysia. My approach is to choose the grass that doesn’t die in a particular location. When we choose the grass that doesn’t die, it then gives the greenkeeper the opportunity to do various things to the grass to get the playability and look that one wants. I would classify bermuda more in the “grass that won’t die” category for that climate than I would zoysia. Zoysia won’t die, but it will get overgrown by bermuda and cool-season grass more than bermuda, I guess. This is very much a climate specific choice. In Thailand I’d use a certain type of zoysia, not bermuda. 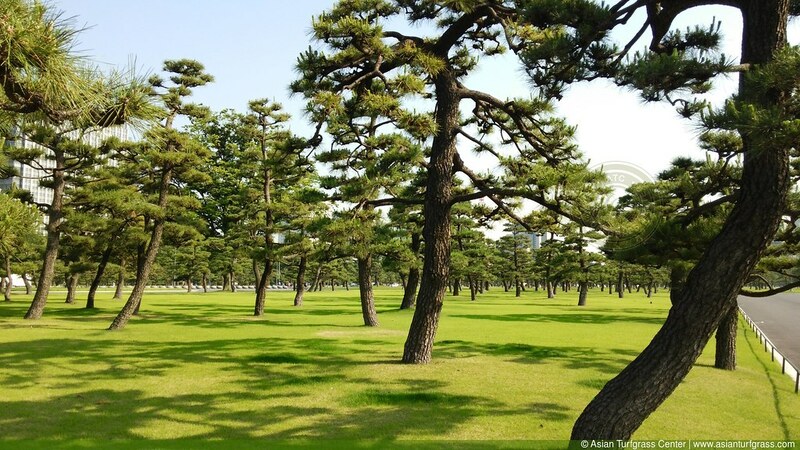 In Japan I’d choose a different type of zoysia, not bermuda. In California I’d expect bermuda to be a better choice than zoysia. Bermuda has great drought tolerance. That’s a primary reason why I think it has a competitive advantage over zoysia in “not dying” in the California climate.